For those of you who really want to know EVERYTHING about Projekt, this page lists old releases that are no longer in print. 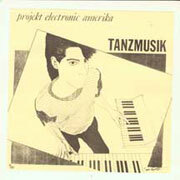 When Projekt began in 1983, it was a cassette-only label releasing music primarily in the “electronic” genre. If you find a cassette of one of these (as somebody recently did in Minneapolis) then you are holding a piece of history!!!! Thanks to Projekt fan James Coulter for emailing me scans of an old catalog from inside his copy of the Mesmerized by the Sirens LP. He helped fill in some gaps! | 60 min | A 1983 sampler of 8 Florida artists including Radio Berlin & Bob Rupe. | 45 min | Electro-Ambient debut. | 90 minutes of electronic mood-music. | 60 min | A sampler of 14 Florida artists including Futurisk, Slap, Happiness Boys, others. | 45 min | All-ambient diversion tape. | Electro-Pop-Ambient-Moodscapes. Visions for a modern world. As far as I can remember, I made 250 copies. I glued a piece of card to the front and to the back of a blank LP jacket. In fact, I’m pretty sure I remember using “spray mount” (on my parents front porch.) to affix them all. I mixed the LP at the house of a friend who went by the name “ONY” — but his 2-track only had small reels, so I brought the “master” to the plant on three small reels, rather than two large reels. This was really confusing to them (as I completely understand, now) and it delayed the release for a while! A copy recently sold for $80 on eBay! | 45 min | Leftover/work drafts of music that missed Tanzmusic. | 45 min | An ambient diversion. Lay back in the April Rain and snooze. | 60 min | Music for the movie inside your head. Growing & Progressing. | 60 min.| Sam is joined by violins and some vocals for a song per side journey. An early incarnation of black tape for a blue girl, with Oscar, Lara and Kim. PRO14.1 1992 Various beneath the icy floe [cassette] | cassette-only label sampler. | tshirt | Wear your heart on your chest with this lovely one size (large) fits all T. Video xerography of Robin from the back cover of The Rope. Gray with Black Ink. Now available on a black shirt. | Live at the Guggenheim on video, with an extra song that didn’t make its way onto the cassette. Not Video art, but a look at two guys in concert. Note: this video was never actually manufactured. | An 11 page stream-of-consciousness story / dream from Sam. A strange tale of love and supression inside the mind, or was it all to real? There were probably about 100 of these made, over time. | Later on cassette and CD. My guess is 750 of these were made. I printed 1000 covers, and probably did an initial run of 500 LPs, and then a 2nd run of 250 LPs. The plant went out of business, and devoured the last 250 covers. The image on the cover was never my first choice, but the stupid quick-print (seriously, those cover photos were most likely developed at Osco!) didn’t print a few of the images which they figured were too blurry to be what I had intended. Years later, when I was putting together the artwork for the CD, I looked at the negatives and discovered that – sitting right there the whole time! – was exactly the shot I had wanted for the cover. That’s why the CD has a different cover image than the LP. | Tshirt | “telling all that she seeked to hide, behind shy and darkened eyes.” A lovely arty t-shirt featring xerographied image of Miira, from the mesmerized by the sirens cover. Note: this shirt was never actually manufactured, as far as I recall. | released briefly on cassette on Projekt; reissued on Archive as R16. In 1991, PRO31 became LYCIA Wake. —————— | Licensed from Italy. I’m expecting this back in soon. | Originally released in a nice box w/art cards. Now it’s equally as nice in a budget-priced 2-CD slimline. PRO56 1995 Ordo Equitum Solis Hecate [cd]| Licensed from Italy. | Originally released in a Digi-pak. Now available as a jewel-boxed edition. | Originally released in a Digi-pak. We actually have some of these back in, for mail-order. Thanks to Robert Stanley for other reminders! If you can fill in any of the blanks, please get in touch.